Are you ready to rock? Are you ready to roar? Let's go! 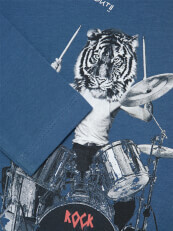 Drumroll please.....this shirt is all kinds of awesome, tigers and drums and fashion oh my! Being cool comes naturally to me but this shirt takes it to a whole 'nother level. My mom says it's great that this shirt is cotton, comfortable, washable and durable, all of her favourite things.